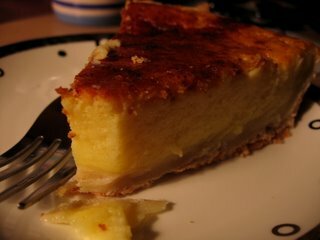 Emmy Lou recently emailed me this article from npr.org on buttermilk pie. "Buttermilk pie?" quoth I. "What in the deuce is that?" Well, fair reader, the buttermilk pie is a Southern delicacy. It's known as a chess pie in some circles, and the article refers to it as creme brulee's culinary cousin. It's a simple recipe, mixes up in minutes, and the results are fantastic. The photograph of the pie in the NPR article looks a bit anemic to me; leave it in the oven for an hour and you won't have that problem. And don't be alarmed when the custard puffs up and cracks! The finished pie settles after it cools. Eat it warm and you'll understand why it's compared to creme brulee; chill it in the fridge and it becomes almost like cheesecake, but with a lighter texture and more subtle flavor. Buttermilk pie does well with a shake of nutmeg on top before you put it in the oven, and I imagine it'll go well with fresh black raspberries come summer. 2. Beat eggs slightly and add sugar and flour. Then add melted butter and mix well. Add buttermilk and vanilla and mix. 3. Dust the unbaked pie shell with a little bit of flour. Pour batter into shell, and then sprinkle a little more flour on top. 4. Bake at 325 degrees until the custard is set, approximately 1 hour.